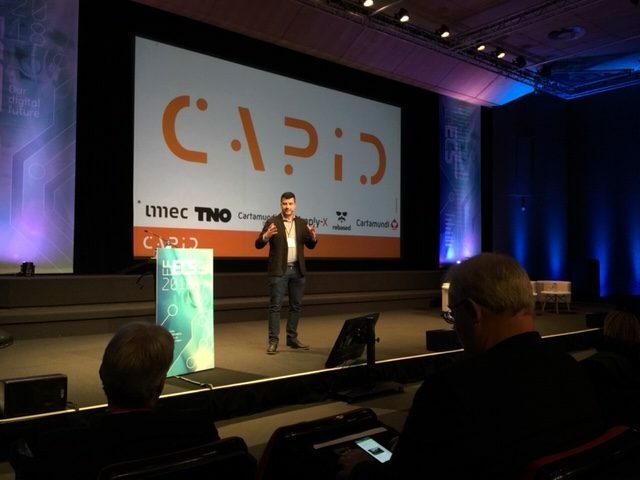 Today, at the 2018 European Forum for Electronics Components and Systems (EFECS), Horizon 2020 consortium CAPID has demonstrated prototypes of paper products augmented with new electronic functionality – Capacitive ID (CAPID). It’s the industry’s first demonstration of capacitive communication using ultra-thin electronic chips embedded in paper. CAPID is a system through which a tiny, flexible tag is inserted into an object. That object — which could be as small as a card or a label — can then be identified when placed on a touchscreen. The potential of the technology is extraordinary particularly when you consider that almost every person in Europe has access to a connected touch device such as a smartphone or tablet. The CAPID project aims to build on this ubiquity. Its aim is to develop a new generation of wireless tags that bring something different and valuable to touchscreen technology. The CAPID tags are thin and flexible devices integrated in paper and plastic products. They send a dynamic capacitive signal into the reading devices which make it possible to identify and locate low cost and high-volume products, like cards or labels, to the internet, just by putting them on a touchscreen. Every CAPID tag will have its own ID. A potentially vast number of tags, all of them identifiable, will make it possible to create unique codes for any product. The new devices will have a very small footprint making it possible to integrate them in a product as thin and flexible as paper. Capacitive communication developed by the CAPID consortium is different from the traditional RFID and NFC technologies. Wireless exchange of information between the tag and the reader is now complemented by the new features – capacitive reader can detect position and orientation of the tags. In addition, this is a short range (contact) communication, which provides additional security feature compared to existing RFID solutions. Today’s prototypes can send information to custom made reader devices. Next year CAPID consortium envisions the use of most standard capacitive touchscreens (smartphones, tablets, etc.) as readers for the next generation of capacitive tags. The new communication devices are enabled by ultra-thin, flexible electronic circuits, which were optimized to operate at low power as part of the CAPID project. Small capacitive antennas are manufactured directly on-chips, as part of the chip manufacturing process. The result is a simple and very low cost tag, since no external antenna nor assembly process is required. Furthermore, the CAPID consortium developed new processes to better align chip fabrication and integration in paper products, reducing the cost of connected paper products. The CAPID project brings together a number of players, from the worlds of research, technological innovation and manufacturing. Three of them will be developing the enabling technology for CAPID devices. They are: Cartamundi, the world’s leading manufacturer of card and board games; Imec, a research and innovation hub in nano-electronics and digital technologies; and TNO, an independent research organisation. Real life applications will be demonstrated in three concrete product prototypes: board games (through Cartamundi Digital, which creates unique applications for mobile and online usage) an example of which was demonstrated at the EFECS Conference; ticketing and access control (through Simply-X, an information technology and services company); and mobile payments (through Rebased, which offers programming expertise). The technology opens up enormous potential for these three areas. Taking what was good in the traditional game play of board games and adding endless possibilities through digital and online concepts e.g. digital animation and up to date changing, connected and immersive new game experiences. From a ticketing perspective, CAPID enabled cards will offer event solutions beyond just the physical event itself, creating an entire experience for guests even after the event in combination with their smartphones. It will also enable event organisers and venue owners to have true end to end access control from authorizing a guest to a physical space or section as well as authorizing a guest via their mobile device. The new CAPID enabled mobile payment system aims to liberate data that is currently restricted for use by leading providers (i.e. Visa, MasterCard etc.) while respecting European privacy laws – no personal data is exchanged. This opens up considerable potential for event or venue owners who don’t have access to transaction data. In addition, the technology will allow any smartphone or capacitive touch screen to become a payment terminal.